Ray Allen’s 30 point game on Monday night – 28 in the second half – against the Chicago Bulls was truly one for the ages. With two seconds left he hit the game winning three to tie the series and give the Boston Celtics life in the best of seven series. For anyone who watched, Ray and his UCONN counterpart, Ben Gordon, went head to head in the second half trading basket after basket in a shooting display reminiscent of the Larry Bird/Dominique Wilkins scoring duel in Game 7 of the 1988 Eastern Conference semifinals. Yet, immediately following the game the Internet was abuzz, not with talk of Ray Allen’s performance, but of another basketball great – Class of ’94 hardwood legend Mike Senckowski. With all this controversy we are asking you to decide. 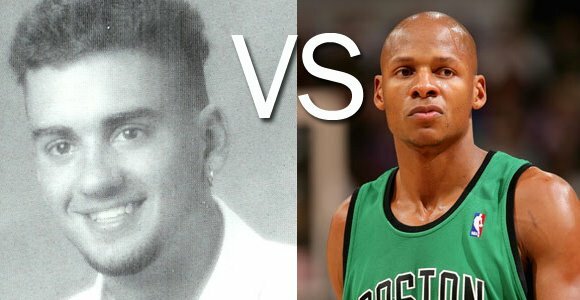 WHO IS THE BEST BASKETBALL PLAYER EVER: MIKE OR RAY?